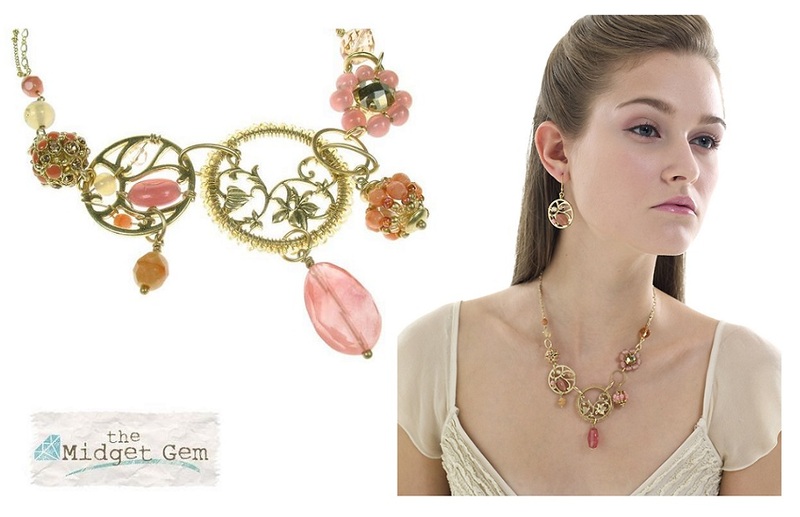 This collection combines floral shapes and silhouettes with semi-precious bead bound frames, freshwater pearls, glass and quartz beads, Swarovski crystals, and woven jewel spheres, to produce this most beautiful set of accessories. We currently have this available in silver plate/green/lemon or gold plate/peach/pink, and also gold/cream/beige. 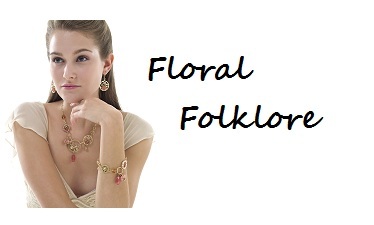 Floral silhouette necklace. Multi-strand chain. Silhouette discs, glass and quartz beads, Swarovski crystal and enamel. Beads measure from approx. 5mm up to 3.3cm/33mm. Length of front drop 6cm/60mm. Adjustable chain 41cm/16 inches to 49cm/19 inches. 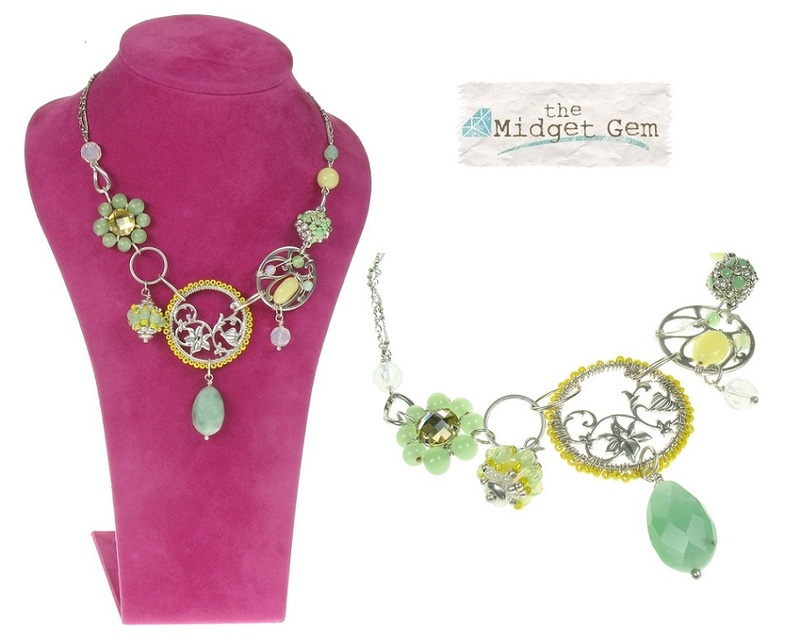 Silver plate & shades of green and yellow. Floral silhouette necklace. Multi-strand chain. 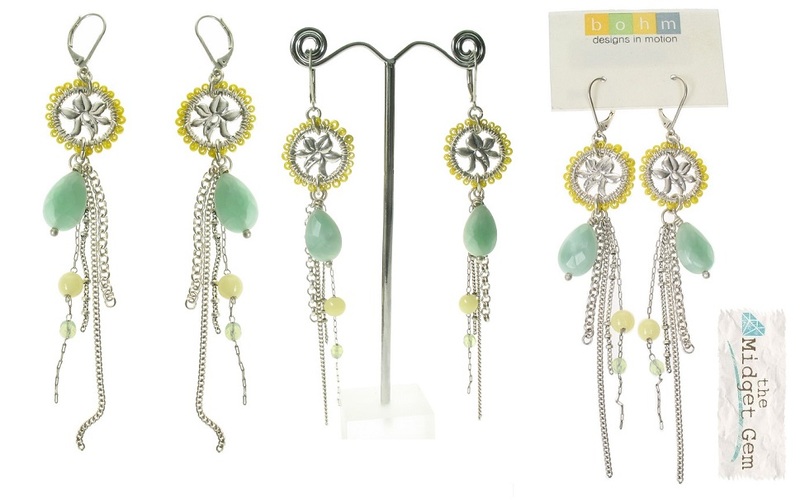 Silhouette discs, glass and quartz beads, Swarovski crystal and enamel. Beads measure from approx. 5mm up to 3.3cm/33mm. Length of front drop 6cm/60mm. Adjustable chain 41cm/16 inches to 49cm/19 inches. Gold plate & peach. 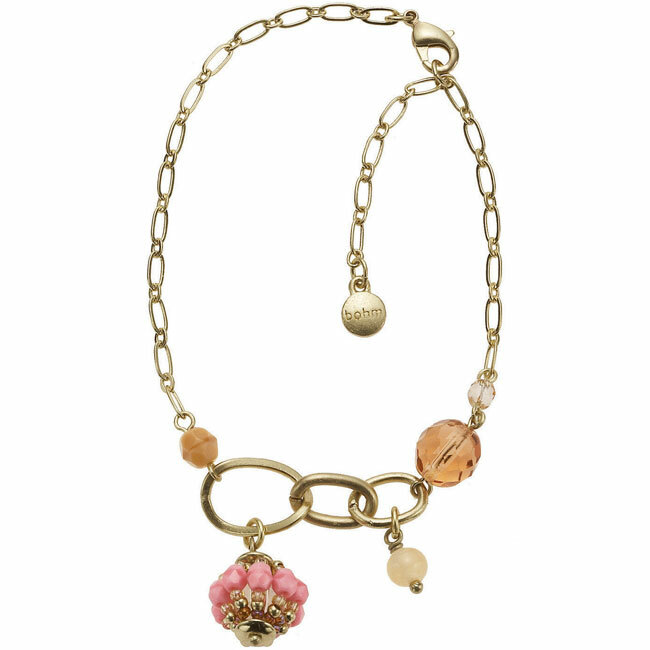 Very pretty bracelet combines an array of different mediums including: freshwater pearls, quartz and glass beads and a floral silhouette. Beads measure from 5mm up to 2cm/20mm. Adjustable length 18cm/7 inches up to 23cm/9.5 inches. Silver plate & shades of green. 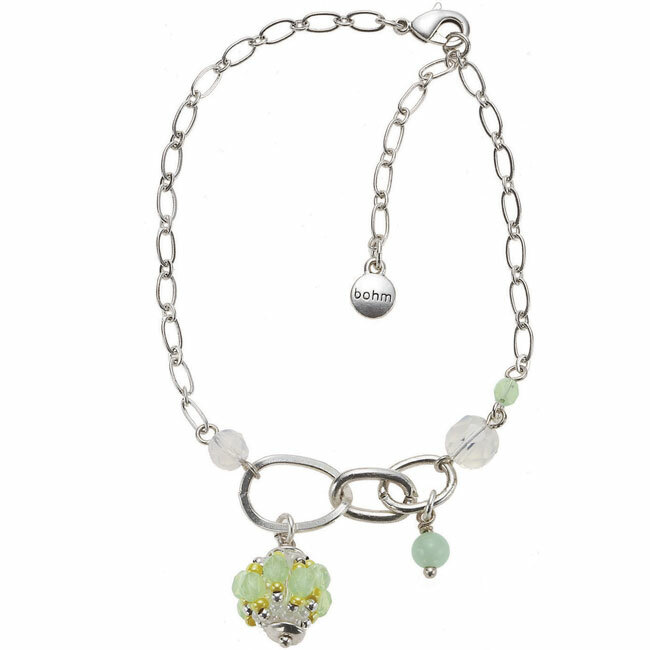 Very pretty bracelet combines an array of different mediums including: freshwater pearls, quartz and glass beads and a floral silhouette. Beads measure from 5mm up to 2cm/20mm. Adjustable length 18cm/7 inches up to 23cm/9.5 inches. Gold plate & shades of peach. Beaded sphere drop ankle chain. Glass and quartz beads. Beads measure from approx. 5mm up to 1.8cm/18mm. Adjustable length 22cm/8.75 inches up to 26cm/10.25 inches. Silver plate/green. Beaded sphere drop ankle chain. Glass and quartz beads. Beads measure from approx. 5mm up to 1.8cm/18mm. Adjustable length 22cm/8.75 inches up to 26cm/10.25 inches. Gold plate/peach. 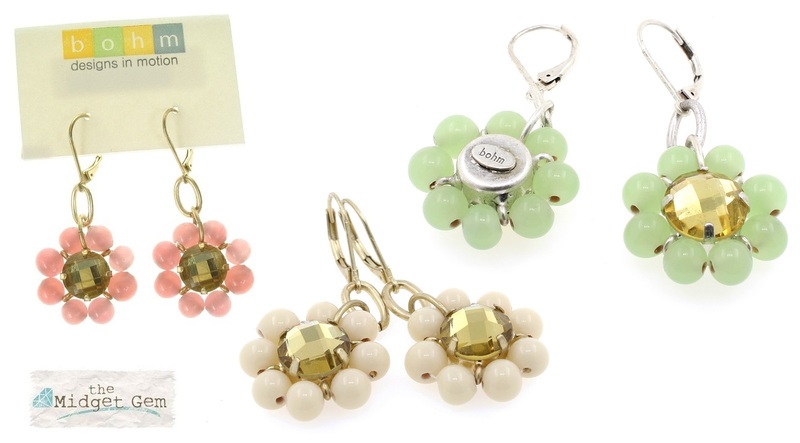 Flower shaped earrings. Glass bead surround with a faux crystal cabochon centre. The flower measures 2 cm/20 mm, total length 5 cm/50 mm. French clip fastener for pierced ears. 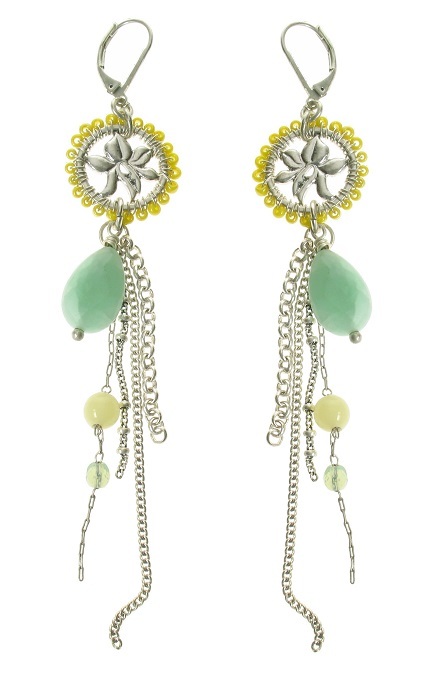 Dangly earrings - floral detail discs with seed bead wire wrapped frames, and cascades of chain with faceted green quartz drops, glass and Swarovski crystal beads. The discs measure 2cm/20mm. Total length 10cm/10mm. French clip for pierced ears. Silver plate/green. 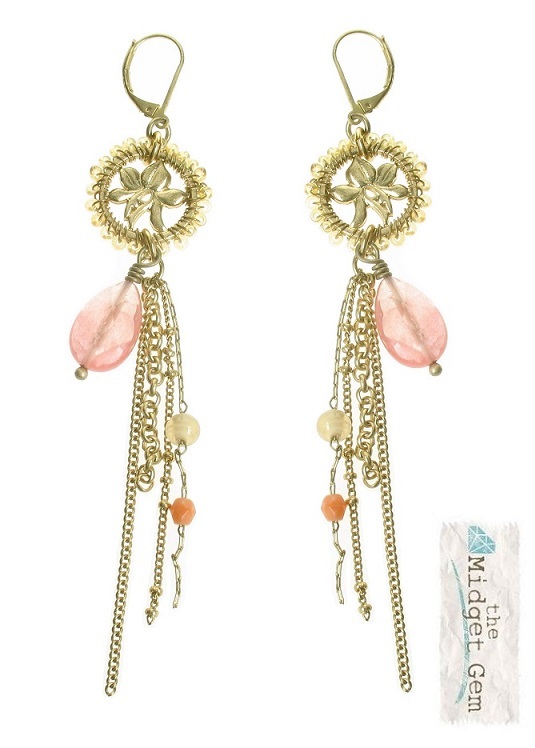 Dangly earrings - floral detail discs with seed bead wire wrapped frames, cascades of chain with faceted peach quartz drops, glass and Swarovski crystal beads. The discs measure 2cm/20mm. Total length 10cm/10mm. French clip for pierced ears. Gold plate/peach. 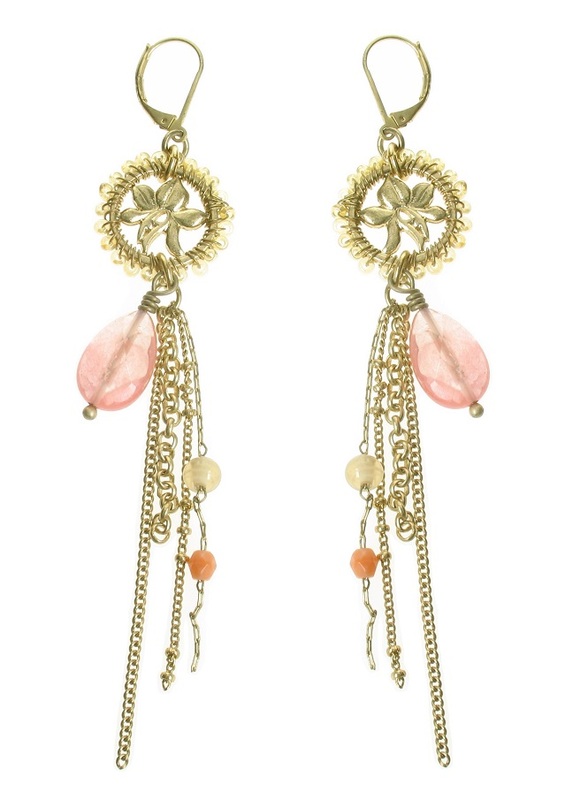 Dangly earrings - floral detail discs with seed bead wire wrapped frames, cascades of chain with faceted beige toned quartz drops, glass and Swarovski crystal beads. The discs measure 2cm/20mm. Total length 10cm/10mm. French clip for pierced ears. Gold plate/cream & beige.